Did you know that you can have a FREE talk about the history of the Disney parks for your group or organization? 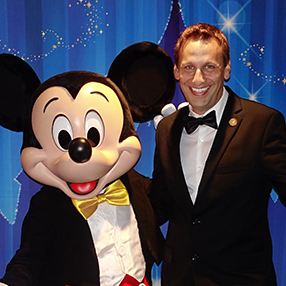 Walt Disney: Creating Kingdoms is an exciting multimedia presentation by my husband, Disney historian Scott Wolf, and is sponsored by myself and Academy Travel, for whom I am an Independent Travel Consultant. In this presentation, Scott delves into the stories he’s learned from interviewing the people who were involved in the creation of Walt Disney’s first theme park. You will learn fun and fascinating facts about the creation of Disneyland and Walt Disney himself, and how his visions have translated into today’s Disney Resort experiences. Scott’s talk is strictly information/entertainment, not a sales pitch for my business. Before his presentation, I simply ask that people follow my blog or remember me when they’re ready to plan their next Disney vacation.